Categories : #Forumelite, Upcoming Events! Get a better look inside The Day & The Life Of… our Coaches & Team Members here at The Forum! Throughout the month of March, we will be posting Instagram Stories of The Day & The Life Of… each of our Coaches!! Have you ever wondered what goes on during The Day & The Life Of… a fitness coach, or wonder what our daily routines, eating habits, highlights, or FAILS of the day are? Please follow our Coaches individual hashtags via Instagram. ie.) 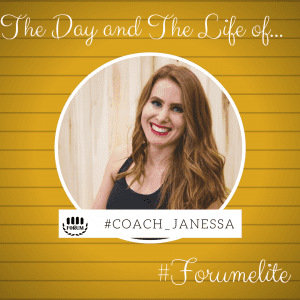 #Coach_Janessa & #ForumElite to link to their stories! What’s in it for me, you ask?! You will be given tasks by each Coach in way of their Instagram Story for chances to WIN SWEET PRIZES and be GIVEN SPECIAL OFFERS on each day their Insta-Story is released!! There is also a GRAND PRIZE at the end of our last Insta-story. Hint: You might need to unscramble a secret message that will cumulatively be in each of our Coaches Stories, but can only be solved after you have seen all FIVE! So, you’ll have to watch to find out!!! How do you do participate? Simple. ➌ Each of our 5 featured Coaches have their own handle, so remember to follow their hashtag as well! There is a complete schedule below stating which days to watch the stories! First up: The Day And The Life Of… #Coach_Shawn Friday, March 9th! Please help us get the word out by sharing this post!